Better integrate your website and Marketo instance with one of our plug-ins. Ultimate Marketo Forms provide a seamless integration experience between Marketo and your website. Implementing full-featured Marketo lead forms on your WordPress website used to require days of expert-level custom coding. With a simple install, our Ultimate Marketo Forms for WordPress plug-in enables benefits like auto-fill, progressive profiling, and custom confirmation page logic. Complete the form below and we will email you a registration code to activate our plugin's full feature set and updates. The registered version of this plugin comes free of charge, courtesy of HyperX. Only company emails are permitted! 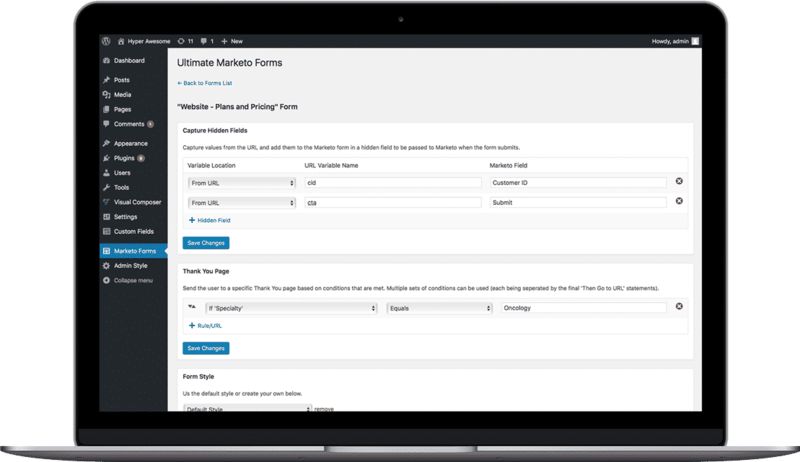 Manage all of your Marketo forms globally in Wordpress. Use shortcodes to place Marketo forms on any post or page on your website. Place as many forms as you need on a post or page, without losing form functionality. Use Marketo's auto pre-fill form fields functionality without the need for custom coding. Take full advantage of Marketo's progressive profiling form functionality without the need for custom coding. Designate unique confirmation page URLs using logical operators for each Marketo form inside your Wordpress admin area. Pull data from URL variables into your Marketo form's hidden fields. Update the default Marketo forms styles to match your website's design with custom CSS support. Quickly test Marketo forms without having them pre-fill each time by using our Clear Marketo Cookies Chrome extension to quickly and easily clear the Marketo cookies. We look "under the hood" and provide you with expert recommendations on how to optimize your instance. Find out how your site stacks up against the competition and get insights that boost your conversions and SEO. Integrating your website with your Marketo instance is a great way to make your life easier and get better results.